To readers coming to it for the first time, John Dryden’s “Mac Flecknoe” can be a baffling work, filled with names and events that are not familiar at all. And it is written in a form, the heroic couplet, that is rarely if ever used by poets today. But it’s also the case that a lot of people in Dryden’s time would not have been able to identify some of the people involved. He is fighting a war within a fairly small circle of (entirely male) literary figures in England, and the conflict is about who has the authority to weigh in on what counts as good literature, and why. 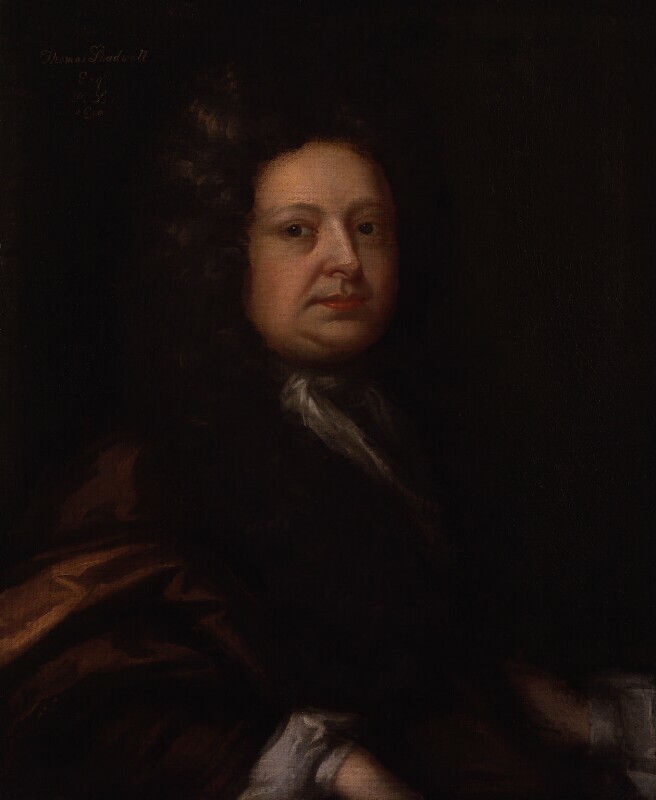 At its essence, the poem is an elaborate satirical fantasy where Dryden imagines the “coronation” of a new “monarch” to rule over the realm of poetic “nonsense.” Here Dryden pictures Richard Flecknoe, an older, mediocre poet and playwright, deciding that his “crown” should go to Thomas Shadwell (1642-92), a younger dramatist who had already by this point enjoyed a great deal of success in the London theater. Dryden’s most consistent running joke throughout the poem is the print the name “Shadwell” as “Sh——.” This was probably done in part to provide a (very thin) cover against being accused of libel, but Dryden is also coaxing the reader to imagine Shadwell’s literary production as so much waste product, figuratively human excrement that is crowding the streets of London: “loads of Sh—— almost choakt the way.” This is brutally unfair; Shadwell was a successful playwright for a reason, and he continued to have success in the London literary world for decades. In fact, he succeeded Dryden as Poet Laureate in 1689, when Dryden was removed from the post because he was a Roman Catholic. But in the eyes of modern literary history, Dryden’s stature and this poem’s influence over readers for generations has pretty much ruined Shadwell’s reputation. Like much of Dryden’s poetry this is an occasional work, prompted by a particular situation or moment. That moment is quite distant from us, and reconstructing exactly what prompted Dryden to unleash this hilarious verbal attack at this point is not completely possible. But all the evidence we have suggests that “Mac Flecknoe” is inspired by a complicated and to some extent overlapping set of issues, literary and personal: issues having to do with the nature of comedy in the theater, issues having to do with poetic authority, but also issues having to do with class, status, and generational change. Shadwell, who was almost a decade younger than Dryden, seems to have seen himself as an up-and-coming rival, challenging the already-established Poet Laureate Dryden. Shadwell consistently mocked Dryden’s rhymed heroic tragedies, which were very popular in the 1660s and early 1670s, as increasingly old-fashioned rants. Shadwell also imported current French theories about comedy and satire, arguing that a chief goal of comedy was to instruct by offering models of behavior to follow and also to avoid; Dryden had long argued that comedy’s main goal was simply entertainment. By the mid-1670s, it was clear that audiences, who might not have cared much about the such theoretical arguments, were supporting Shadwell at the box office. Heroic drama was falling out of fashion (Dryden himself stopped writing such plays after 1675), and it was Shadwell, not Dryden, who had a string of successful comedies (including one, The Virtuoso, a satire on the new Royal Society, that is still sometimes performed). Meanwhile, Dryden was also being mocked by his social betters; the Duke of Buckingham’s 1671 play The Rehearsal featured a stupid playwright called “Bayes” who was pretty clearly a figure for Dryden. In about 1675, the Earl of Rochester’s poem “An Allusion to Horace” started making its way in manuscript around literary circles. Here, Rochester praises Shadwell and other new playwrights like William Wycherley (author of The Country Wife) and George Etherege, but mocks Dryden as a bad rhymer who lacks the wit of the younger men. Dryden was in no position to take on Rochester, a very powerful and potentially dangerous man. But, as Kirk Combe suggests, Shadwell became a safe target by which Dryden could defend himself and outflank the attacks that were by now coming from those he considered to be his lessors (the younger upstarts) and those he knew to be his social betters (Buckingham and Rochester). “Mac Flecknoe” is the result. It is an occasional poem, but it helped set a lot of terms for how high and low culture got talked about for generations; in imagining a sequence of great–or terrible–writers as a kind of succession akin to the succession of a monarchy, it also sets up a model of literary generations as dominated by a series of great men. “Mac Flecknoe” was thus probably written in 1676, and it circulated in manuscript in literary circles in London for several years. The poem was first printed in1682 in an edition that Dryden almost certainly did not authorize (the publisher, “D. Green” is otherwise untraceable, suggesting that whoever was being the publication of the poem did not want their identity known; the text is also filled with typographical errors, suggesting quick and sloppy printing). In 1684, the poem was published as part of a more respectable collection of poems by several authors, and this time, the text is much cleaner; it seems likely that Dryden had the chance to proofread. The version published in that 1684 collection is the text reproduced here. We have consulted The Works of John Dryden, Poems 1681-84, ed. H. T. Swedenberg et al. (Berkeley: The University of California Press, 1972), the standard scholarly edition of Dryden’s works. For further reading: Kirk Combe, “But Loads of Sh— Almost Choked the Way”: Shadwell, Dryden, Rochester, and the Summer of 1676,” Texas Studies in Language and Literature 37 (Summer 1995): 127-164. But Sh—– never deviates into sense. The like was ne’er in Epsom blankets toss’d. And Sh—– they resound from A—- Hall. Thou wield’st thy Papers in thy threshing hand. And vow’d he ne’er would act Villerius more. In silent raptures of the hopefull boy. And, undisturb’d by Watch, in silence sleep. Ambitiously design’d his Sh—–‘s throne. Of Sh—–‘s coronation through the town. But loads of Sh—– almost chok’d the way. And H——- was Captain of the Guard. High on a Throne of his own Labours rear’d. Rome’s other hope, and pillar of the State. And lambent dullness play’d around his face. Ne’er to have peace with Wit, nor truce with Sense. Presage of Sway from twice six Vultures took. And greater than his Father’s be his Throne. He paus’d, and all the people cry’d Amen. Yet not one thought accuse thy toyl of wit. And in their folly show the Writers wit. And justifie their Author’s want of sense. Sir Formal’s oratory will be thine. By arrogating Johnson’s Hostile name . And Uncle Ogleby thy envy raise. What share have we in Nature or in Art? Or swept the dust in Psyche’s humble strain? Promis’d a Play and dwindled to a Farce? As thou whole Eth’ridg dost transfuse to thine? And in all changes that way bends thy will. Of likeness; thine’s a tympany of sense. But sure thou ‘rt but a Kilderkin of wit. Thy Tragick Muse gives smiles, thy Comick sleep. Thy inoffensive Satyrs never bite. Some peaceful Province in Acrostick land. Born upwards by a subterranean wind. With double portion of his Father’s Art. The frontispiece from Phillis Wheatley’s Poems on Several Occasions (1773). This is the only portrait of Wheatley from her own lifetime. 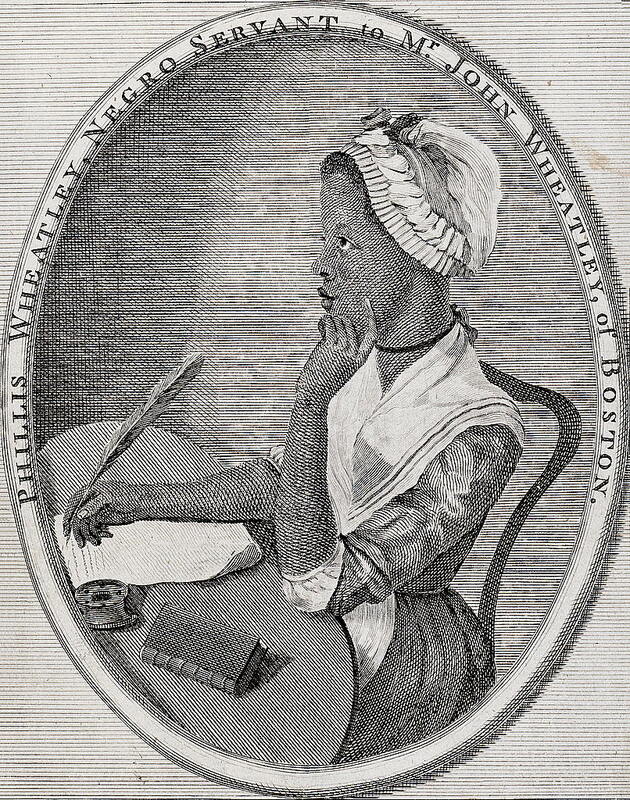 Phillis Wheatley (c 1753-1781) was the first African-American woman to publish a volume of her own poetry. She was born in west Africa and was brought by ship to Boston in July, 1761; she was believed to be seven or eight years old. The slave ship that carried her was called the Phillis, and she was given that name upon her arrival; there is no record of her African name and we do not know anything about how she was captured and enslaved. She was purchased by the Wheatleys, a well-off and prominent Boston family. John Wheatley was originally a tailor who branched out into a substantial business in wholesaling, shipping, and money-lending; his wife Susanna became an active supporter of Methodist and Presbyterian missionaries who came from England to preach in the colonies. When they purchased Phillis, the Wheatleys had eighteen-year-old twins, Nathaniel and Mary, and several other slaves working in their household. The Wheatleys seem quickly to have recognized Phillis’s precocious talents with language, and taught her to read English, almost certainly starting with the Bible. Before long, however, she was reading the works of English poets like Alexander Pope and John Milton, as well as English translations of classical poets like Homer, Virgil, and Ovid. John Wheatley testified that within sixteen months of her arrival, she was able to read even the most difficult parts of the Bible, which is extraordinary for any nine-year-old and pretty much unprecedented for African-American slaves in the eighteenth century, most of whom were never taught to read by their masters; white slave owners generally feared teaching their slaves how to read and write lest they use those tools to work against the system that enslaved them, and in many places it was illegal to teach slaves to read. Phillis began publishing poems in New England newspapers at the age of fourteen, and continued to publish occasional poetry (that is, poems on particular current occasions or events) in newspapers over the next several years. An advertisement placed in the Boston Censor for February 29, 1772, soliciting subscriptions for a Boston edition of Wheatley’s poems. The solicitations seem to have fallen short of what was need to publish the volume, and the Wheatleys turned to the Countess of Huntington, a prominent supporter of the Methodist movement, to subsidize publication of the book in London. She had a breakthrough of sorts when she published her elegaic poem “On the Death of George Whitefield” in October 1770. Whitefield, the most famous preacher of the day, had preached several times in August 1770 at the Old South Church in Boston (Wheatley may have heard him then; the Wheatley family certainly knew him personally), but died unexpectedly the next month in Newburyport, Massachussetts, about 35 miles north of Boston, and was buried there. Wheatley’s poem was widely sold in New England, and then republished in London to great acclaim. The Wheatleys sought subscribers for a volume of her poetry to be published in Boston, but they do not seem to have attracted enough of them to make the venture financially viable (why they did not subsidize it themselves is unknown; they certainly could have afforded to). They turned Archibald Bell, a London publisher of religious texts, who was able to gain the patronage of Selina, the Countess of Huntington. She had been George Whitefield’s patron and was a prominent supporter of Methodist causes in England. The Countess helped subsidize the publication of Wheatley’s Poems on Various Subjects, Religious and Moral in 1773, which Wheatley in turn dedicated to her. Phillis Wheatley went to London (accompanied by Nathaniel Wheatley and traveling on the Wheatleys’ own ship) to supervise the printing and publication of her book, and was treated as a celebrity, meeting aristocrats and prominent public figures (including Benjamin Franklin, then resident in London officially as an advocate for the colony of Pennsylvania, but serving in general as a voice for the cause of the American colonists), and being given tours of the Tower of London and the British Museum. She returned to Boston just before the book was published, however; Susanna was ill (she died in early 1774), and Nathaniel may have prevailed upon her return to help take care of her. But, as Vincent Caretta suggests, Phillis may also have made a deal here, exchanging her willingness to return to Boston for the guarantee of her freedom. In any case, she was given her manumission in October 1773, and although she stayed a part of the Wheatley household until the death of John Wheatley in 1778, she was now a free woman. After John Wheatley’s death, Phillis married John Peters, a free black man. She solicited subscriptions for a second volume of poetry, but with little success, and although some of the poems that would have gone into the volume were later published in newspapers, a lot of them were lost. John Peters had financial troubles and spent much time in jail for debt. He was in jail, in fact, when Phillis died of unknown causes in December 1784. Readers immediately recognized the great skill with which Wheatley adapted contemporary English poetic forms, such as the heroic couplet and iambic pentameter blank verse, and classical models to topics such as her own enslavement and the situation of the American colonies. It is not surprising to discover that many contemporary critics had a hard time disentangling her identity as a teen-aged African-American slave from their evaluation of the quality and significance of her verse. Her publisher Archibald Bell insisted, it seems, that John Wheatley have prominent Bostonians testify that the poems were indeed by Phillis and not written by someone else, and he did so; the testimony appears at the beginning of the published Poems. Other critics enlisted her in the nascent abolitionist cause, using her obvious gifts as evidence for the equality of Africans with Europeans, and proof that slavery was immoral. As scholars in recent decades have studied and recovered her poems and letters, Phillis Wheatley’s place as one of the most important and originary voices of American literature has become secure. I am now going through my syllabus for the fall 2016 semester, adding texts that we need. One of the authors I most want to spend time on is Anne Bradstreet. She was the most important Puritan poet in seventeenth-century New England, or, perhaps better, the most important poet whose works have survived to reach us. Her poetry was first published in London, in a book called The Tenth Muse, the idea being that a tenth muse had arrived in the Americas, one who was going to add to, or even outdo, the muses of Europe. Her works were widely reprinted, and she continues to be in modern anthologies as a representative figure of Puritan America. But what shall we read, and where shall we find it? Most of the poems in modern anthologies are the shorter poems, such as the “Verses on the Burning of our House,” or the poems Bradstreet wrote to her husband, or poems about her children. That is, most of these are domestic poems, about her home and family. They’re fine poems, but it’s hard not to think that they’ve been anthologized because they’re 1) short and 2) seem to be about the kinds of things that people expect poetry by women to be about. But they were not the only kinds of poems that Bradstreet wrote. In fact, most of The Tenth Muse is devoted to much longer poems, about the seasons, the history of the world, the rise of empires. I want to make these available somehow, but editing them will be laborious. In the short term, I want to produce a poem that sort of fits in the middle of the poles of domestic and political poems. It’s Bradstreet’s “A Dialogue Between Old England and New.” Here, the poet imagines a discussion between New England and the homeland, both of them figured as women. It’s a clear allegory of the English civil war, and also of the hope implied in the title The Tenth Muse that America might be able to help the “mother” country overcome its struggles. I am now thinking that we will start the semester with this poem. More to come.